People don't like to be taxed. They really don't like to be taxed if they don't have a say in it. The principle cause of the American revolution was not taxation in itself, it was that the colonists didn't have a say in who and what was taxed. Now, let's imagine how this would be handled when you are talking light years. To understand how distances work in Galactic Civilizations, we need to understand Hyperspace Projection. I'm the map I'm the map I'm the map! In Galactic Civilizations, we have to deal with with an extra dimension known as hyperspace. In the year 2178, the humans of Earth invented Hyperdrive which is what kickstarted an intergalactic space race to colony grab. The way Hyperdrive works is by channeling massive amounts of energy to fold space. 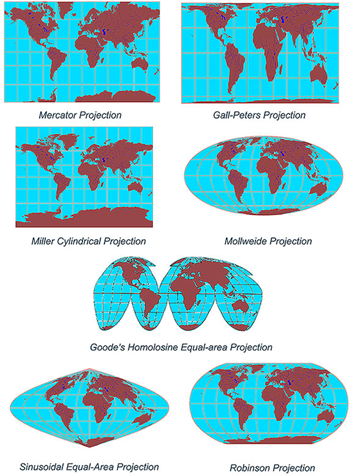 Even with Hyperdrive, we need a way to illustrate space and time on a 2D map, and this is where hyperspace projection comes in. Here is a map from Sol to Tau Ceti. It's 11.9 light years away. 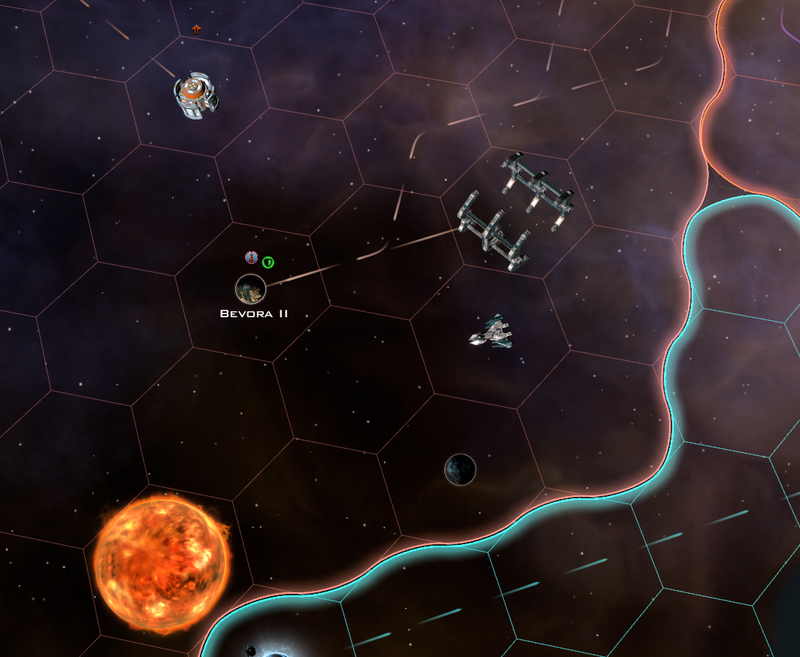 But in GalCiv it's 11 hyper-parsecs away (even though a parsec is about 3 light years). Why? Because in Galactic Civilizations, mass drastically interferes with hyperspace. Saturn, for example, is 4 hyper-parsecs from Earth despite being "only" 1.2 billion KM from earth. What does this have to do with the taxation of distant colonies? Not much. But this diversion illustrates the immense distances we are talking about. 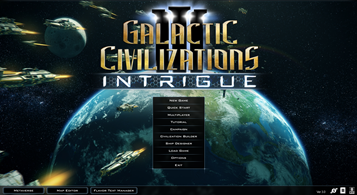 In Galactic Civilizations III: Intrigue you have a tax slider. Your civilization's economy is made up by your gross domestic product (GDP) which is the amount of commerce that's occurring on your worlds plus trade with other civilizations and tourism. Your take of it is what percentage of all that you tax. The higher your taxes, the more angry your people are. Low approval will affect the productivity of your planets as well as make it a lot harder to win elections. We'll be talking more about elections soon, but suffice to say, you do not want to lose elections. High approval can greatly improve your growth, raw production and influence. Conversely, low approval will lower your influence and population growth. Tourism = Every tile you own X your ability to extract money from it. You've heard the term "tourist trap". Every tile you control represents an area of space that you have cultural influence in. Your planets and starbases generate cultural influence and it grows over time. You can mouse over a given empty tile to see who has what influence in a tile. 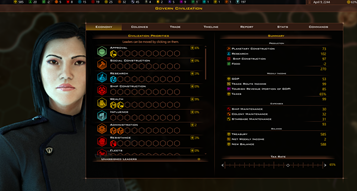 Influence is generated by your planets and starbases. Cultural influence is one of the few statistics not tied to population. We call this the "France" effect, whereby a nation state exerts a lot of cultural influence independently from its raw population. Your influence spills out from your worlds and travelers through your area of space may visit your worlds if there's something to see. Tourist improvements attempt to capture a percent (a very small percent) of the travelers through your influence. 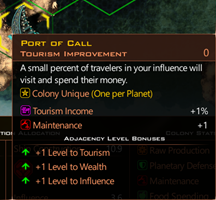 The tourism improvements will tend to have very small percentages. For instance, the Port-Of-Call provides a 1% addition to your tourism income. Why so low? As someone in marketing could tell you, a 1% conversion rate is actually pretty good. 1% of the people traveling through your space will visit this port. That's a huge number actually. 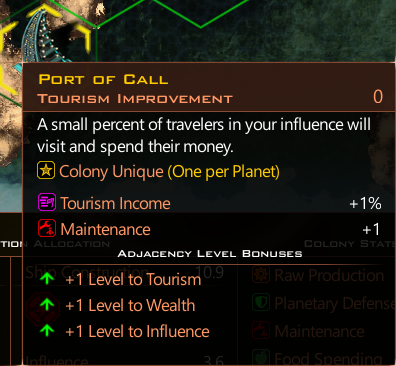 I'm very excited by the tourism updates - I've been looking forward to it ever since you gave hints. Also love getting a tax slider back. On top of government choices from the first journal, this is looking to be a great expansion to Crusade. I like what i read ! 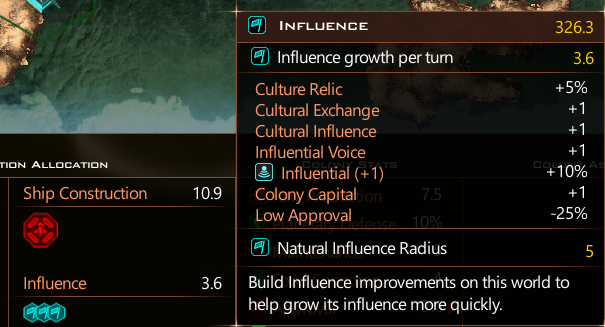 Since we're talking about influence : Could we see when the Natural Influence Radius of a planet/starbase will grow ? Something like "Next increase 300/800 (5 turns)" would be interesting to have. But Net weekly income is 2? Isn't that how government works? You've heard the term "tourist trap". Will there be other "Tourist Traps" in the game besides Port of Call? I seems to me that some of the races, or types of races, could have some different and interesting types of "Traps". I hope you have made some really useful tutorials for Intrigue. I havent played GalCiv for a long, long time and it seems nothing will be the same. Yes. There is, for instance, Bower's World. DO NOT GO THERE. I got "stomach flu". WOW! Bower's World must really be bad if you need to tell me 3 times that I shouldn't go there. I'll be sure to stay away, unless I'm playing as a synthetic race. They probably don't get the "stomach flu", unless they get something worse. This is how the Kessel run was made possible, in less than twelve parsecs, no doubt. Looking forward to the appropriate portion of spring! Can we impose a Synthetic Tax? See, The Guild are a Carbon Race and while, of course, we welcome all races to come and visit, we, uh, don't feel comfortable with those synthetic types and feel they should pay a "We Know We're Weird, Here's 5BC To Make You Feel Better About Us" tax. I'm guessing where all this talk about hyperspace and how colonies, while technically being all One Happy Family under your Civilization, don't really give much of a brass razoo about each other as they're light years apart is going is that there's going to be lots of "Let's give Planet 27 some autonomy, they're upset we're giving Planet 35 some of their taxes..." or "Let Planet 27 do what the heck they want, just so long as they don't stuff it up too bad..." type management. Do we get an option to take away their guns and then tax them without representation? It would only be meaningful if they had atomic bombs for me to take away. Maybe this is partly due to the US / EU divide as I know many Americans resent and distrust government but I've always been happy to pay tax . I'm proud to know that I'm giving something back to a society that has helped me, paying it forward and providing education and healthcare etc to others. I was perfectly happy when my tax bill recently went up. I appreciate all politics in games will be naturally guided by the perspectives of the development team and I'm not complaining, just pointing out that I and many people I know are very happy to be taxed. I'm aware many aren't, of course. Nope. Most would rather make their own money and spend it on improving themselves and others rather than trust a bunch of know it alls to spend it "wisely". Taxation, low approval and elections sound for another problematic field for "evil" races like the Drengin. Is there another way they deal with that? How long will it take for the "crying" to start when the easy approval goes away. 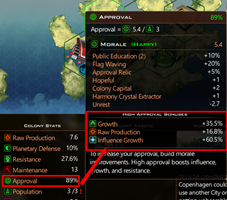 Remember the grumbling about the large civ approval penalty, everyone modding around it. I look forward to the new system and I always liked the sliders. 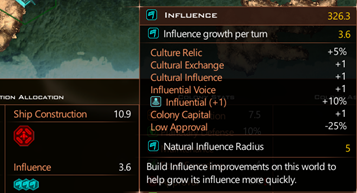 My activity on GalCiv3 has been very low due to the lack of controls to manipulate tax rate -- and the resultant approval rate. 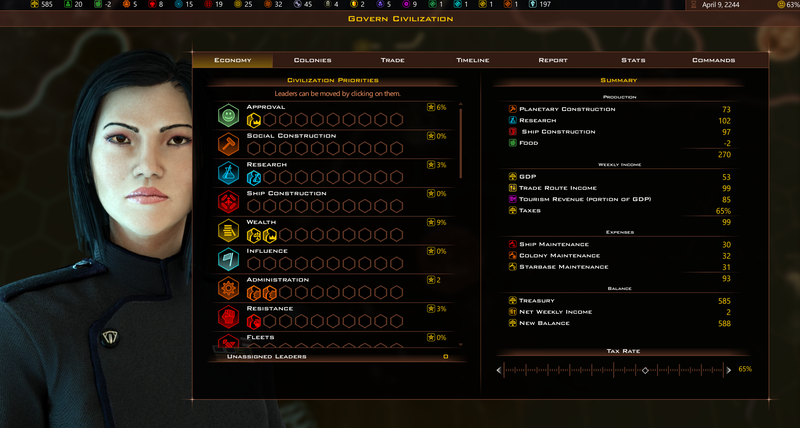 It looks like Intrigue will solve this issue. 1) Will there be a beta? 2) Since I have an early access release ($100 on the EA of the initial release of GC3), is there any benefit to pre-ordering? There is a public beta available now. How do I get at it? Here is the code for the 3.0 beta. Elite Founders will receive the expansion, so no need to pre-order.